A couple of posts ago, I mentioned that I’d treated myself to some new crochet needles, as a spur to help me learn. I learnt to knit as a child, taught by my mum, but I’d never got to grips with crochet, probably because she didn’t either! 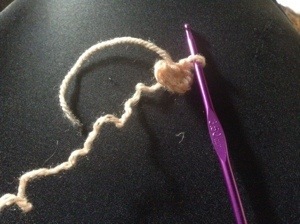 I like to learn by doing so I trawled http://www.ravelry.com for easy patterns, and with the help of http://www.crochetspot.com set to. 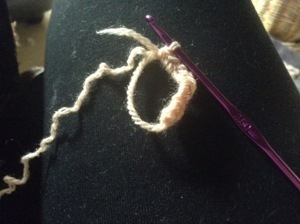 I can thoroughly recommend it, if you want to learn, but bear in mind one thing (which I didn’t realise at first, which caused a fair amount of frustration) the UK and US have different terminology for the same stitch; eg a UK double crochet is a US single, and so on. So I learnt US because the majority of online patterns are from the states. I think once I’m more familiar with it all them I’ll manage to switch between both, but for the meantime I’ll stick with what I (nearly) know. So….I thought I’d bring you a little pattern. 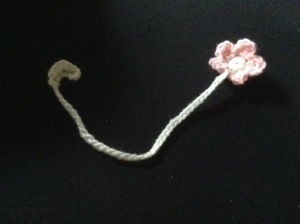 I was inspired by this pattern http://www.ravelry.com/patterns/library/flower-tales-bookmark but I couldn’t work the tail, so I improvised and made my own version. So you start with a magic circle (still working on that, sometimes it works, sometimes not so much) and sc 10 into it. Sl st to join. 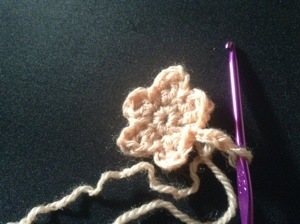 Chain 3, triple into next stitch, double into same stitch, sl to next. Repeat all the way round. I’m planning to stock some of these in my etsy shop when I get it going as they’re a quick and nifty little gift for people. I’m also looking at adding beads and sparkles and possibly doing them in wirework….which is where my next learning curve begins! 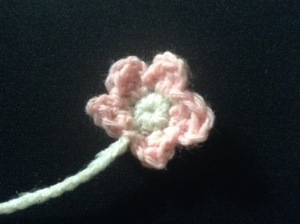 This entry was posted in crochet and tagged bookmark, Crochet, flower.